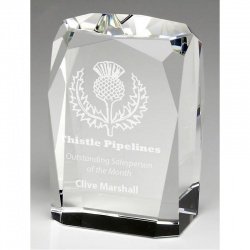 An extensive collection of glass plaques and crystal shields all available to buy online with low-cost engraving and/or colour print branding options. 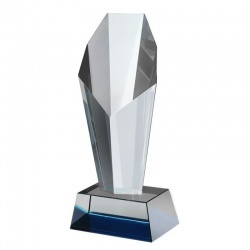 Freestanding Crystal Circle Award with Silver Star. 2 sizes. 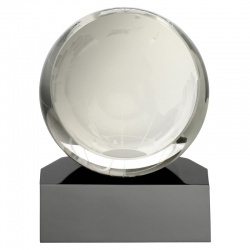 6in Clear Crystal Globe set in Flat Frame on Base. 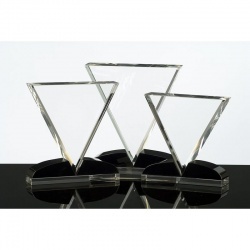 Clear Crystal Awards in Summit Design on Crystal Base. 3 sizes. 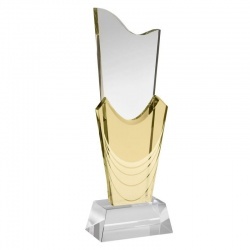 10.75in clear and yellow coloured glass trophy with bevelled base. 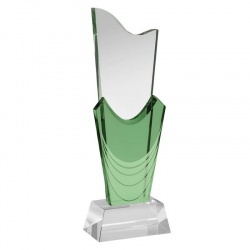 10in clear and green coloured glass trophy with bevelled base. 11.5in clear and blue coloured glass trophy with bevelled base. 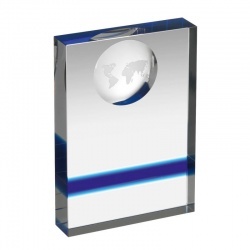 Full 3D globe inset into plaque. Presentation boxed. 11in tall. Full 3D globe inset into plaque. Presentation boxed. 13in tall. 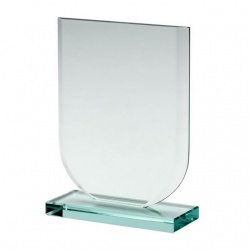 Premium quality glass award. Supplied boxed. 4.5in tall. 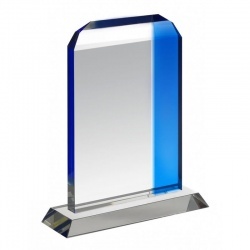 Arched top clear crystal award with blue glass. 4.75in tall. 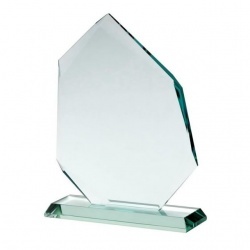 15mm Thick Clear Glass Circle Award on Flat Base. 4.75in tall. 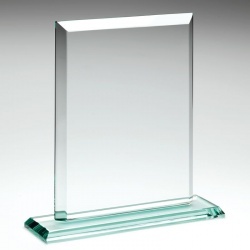 Premium quality glass award. Supplied boxed. 4in tall. 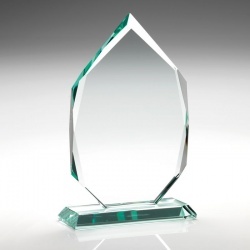 Jade Flat Glass Awards in Circle Design on Flat Base. 4in tall. 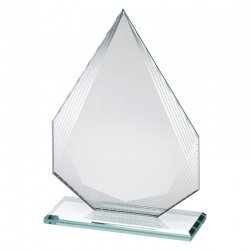 Freestanding Clear Crystal Award in Glacier Design. 2 sizes. 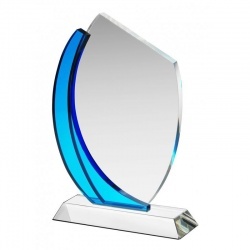 Jade glass plaque with curved top and curved blue glass insert. 3 sizes. 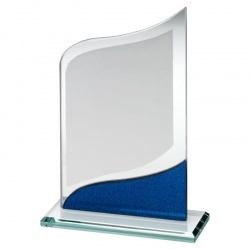 Modern jade glass plaque with blue glass insert and silver trim. 3 sizes. 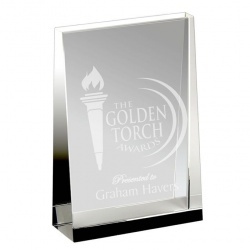 Flame Shape Plaque in 10mm Jade Glass, Supplied Boxed. 4 sizes. 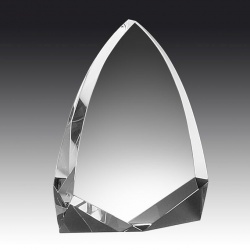 5.25in Star Award in 10mm Thick Jade Glass. 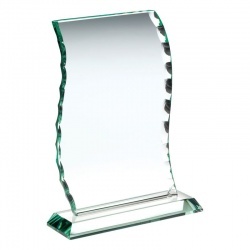 Arched top clear crystal award with green glass. 5.5in tall. 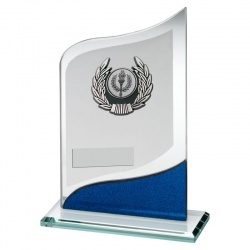 Modern design jade glass plaque with blue glass insert. 3 sizes. 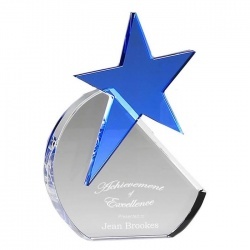 Modern plaque in jade and blue glass with gold trim around a gold star centre. 3 sizes. 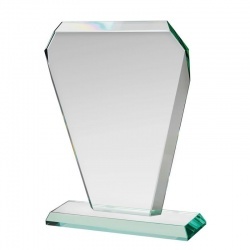 12mm jade glass, octagonal design, presentation boxed, 3 sizes. 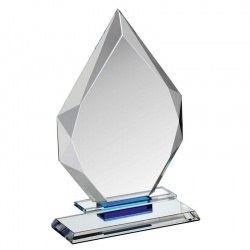 10mm thick jade flat glass rectangle plaque award. 3 sizes. 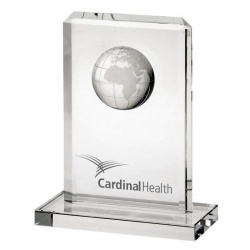 5.75in freestanding glass plaque with inset globe. 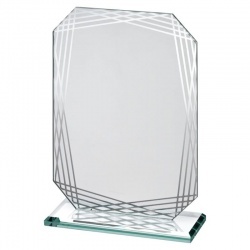 Jade glass plaque with chipped edge decoration and black insert. 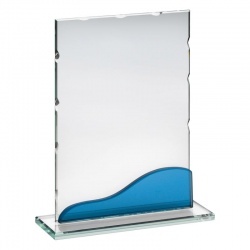 Jade glass rectangular plaque with dimple edges and wavy blue insert. 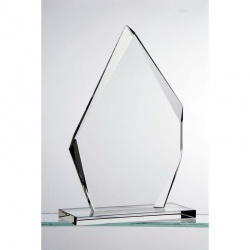 Freestanding Clear Crystal Award in Iceberg Design. 2 sizes. 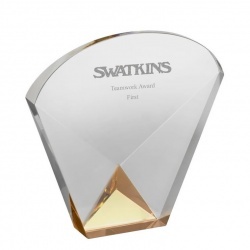 5in freestanding glass plaque with inset globe. 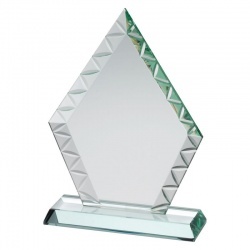 10mm thick jade glass cube design award with facet edges. 3 sizes. 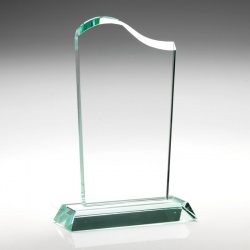 10mm thick jade glass wave award with facet edges. 5in tall. 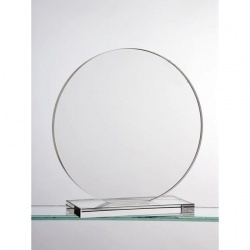 10mm thick clear glass on circular black glass base. Supplied boxed. 3 sizes. 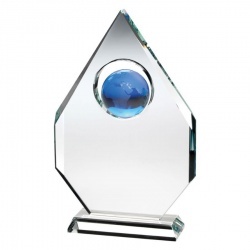 6.25in freestanding glass plaque with inset globe. 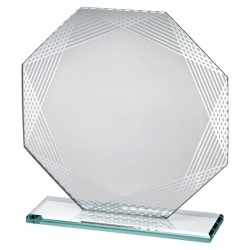 Octagonal plaque in jade glass with silver line decoration. 6.25in tall. 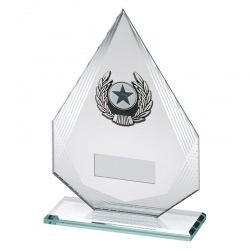 6.25in Star Award in 10mm Thick Jade Glass. 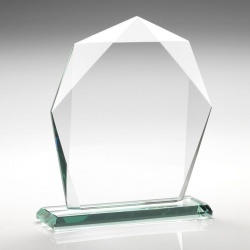 Arched top clear crystal award with yellow glass. 6.25in tall. 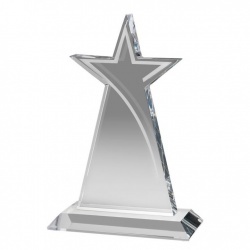 Crystal Award with Clear Half Circle and Aquamarine Star. 6.5in tall. 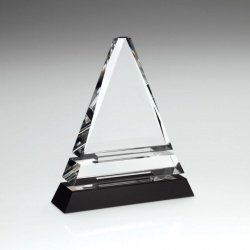 Triangular Award in Clear & Black Glass. Presentation boxed. 3 sizes. 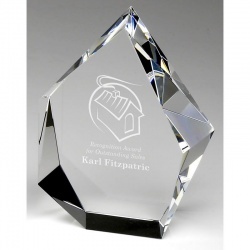 Rectangular plaque in clear and blue glass, on base. 3 sizes. 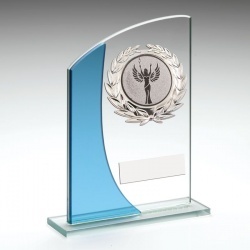 Modern awards plaque in jade and blue glass with silver colour panel. 3 sizes. 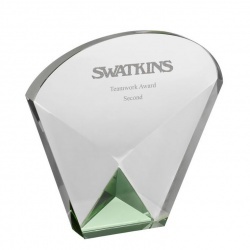 Jade glass plaque in peak design with silver decoration and 1in centre. 3 sizes. 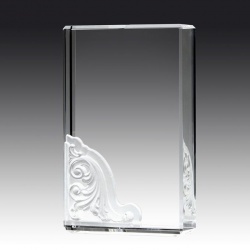 Jade glass plaque in peak design with silver line decoration. 3 sizes. 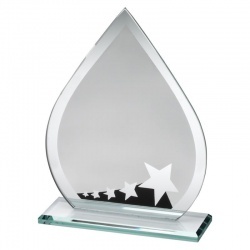 Teardrop shape jade glass plaque with black & silver trim, 3rd place motif. 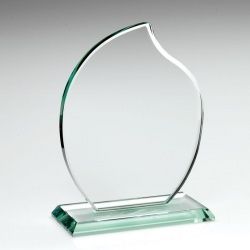 'Autumn Leaf' award plaque in 12mm thick jade glass. Supplied boxed. 3 sizes. 10mm jade glass. Gift boxed. Colour print option. 6.5in tall. 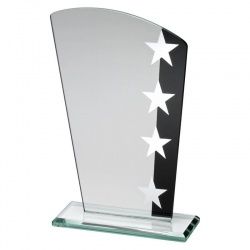 Jade glass plaque with silver and black decoration and stars motif. 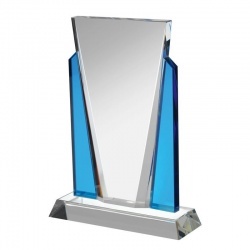 Modern awards plaque in jade glass with blue panel & silver trim. 3 sizes. 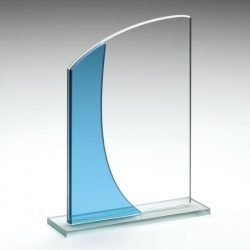 Asymmetric jade glass plaque with blue insert and silver panel. 6.5in tall. 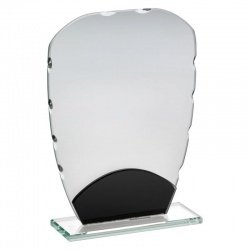 Asymmetric jade glass plaque with red insert and silver panel. 6.5in tall. 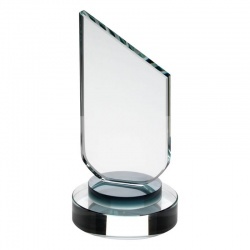 15mm thick jade glass award in diamond shape. Presentation boxed. 3 sizes. 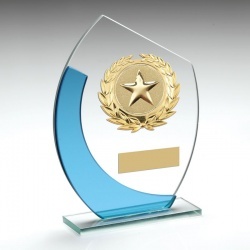 15mm Thick Clear Glass Circle Award on Flat Base. 6.75in tall. 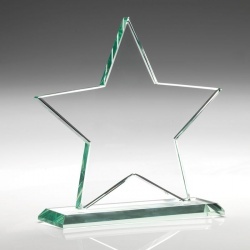 6.75in Plaque with Star, in 10mm jade glass. Supplied boxed. Jade glass plaque with angled corners and silver line border decoration. 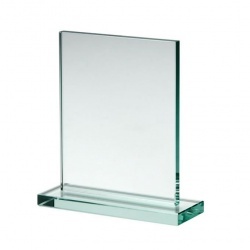 6.75in Star Award in 10mm Thick Jade Glass. 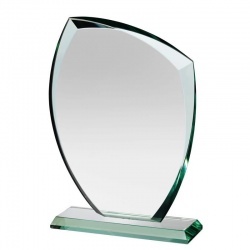 Tapered flat glass awards plaque in 12mm jade glass. 3 sizes. Jade glass plaque with sporty blue and gold decoration, 6.75in tall. 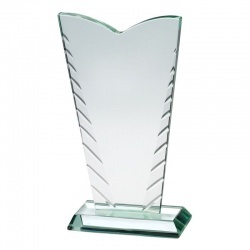 10mm thick jade glass award in irregular iceberg design. 6in tall. 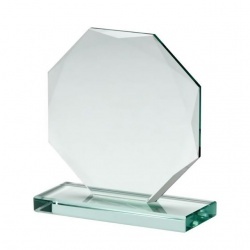 Jade Flat Glass Awards in Circle Design on Flat Base. 6in tall. 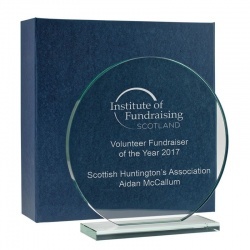 6in Rectangular Plaque in 10mm Jade Glass, Supplied Boxed. 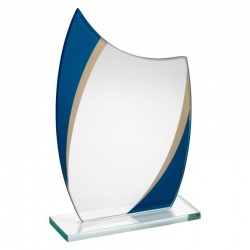 Jade glass plaque with sporty blue and gold decoration, 6in tall. 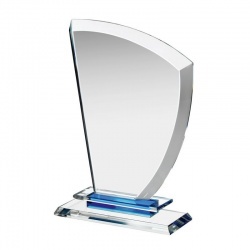 10mm thick jade flat glass teardrop design plaque. 6in tall. 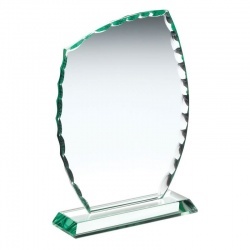 10mm thick jade glass wave award with facet edges. 6in tall. 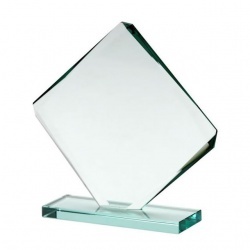 Optical crystal block with pate de verre decoration. 7 3/8in tall. 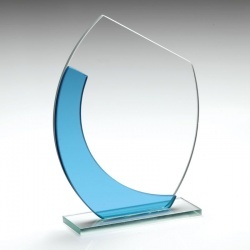 Modern clear and blue glass plaque award. 2 sizes. 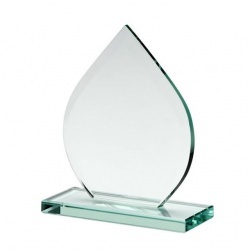 Sail shaped plaque on clear & blue glass plinth. 3 sizes. 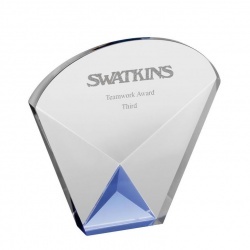 Clear and blue flat glass plaque in curved design. 3 sizes. 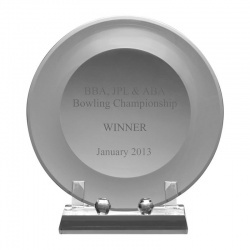 Clear and blue glass plaque in deco style, on base. 3 sizes. 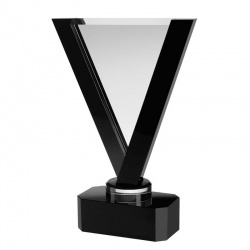 Seven-sided column with sloping face, on bevelled base. 3 sizes. 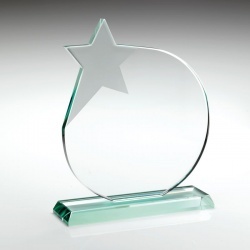 7.25in Clear Flat Glass Award in Star Shape with Swoosh. 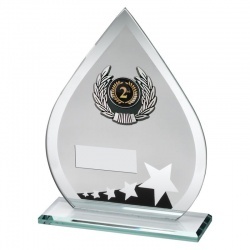 Teardrop shape jade glass plaque with black & silver trim, 2nd place motif. 10mm jade glass. Chevron styling. Supplied boxed. 7.25in tall. 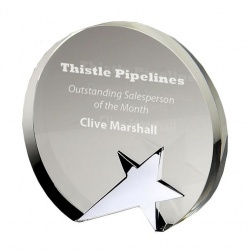 7.25in tall Patterned Edge Plaque in Peak Design, Supplied Boxed. 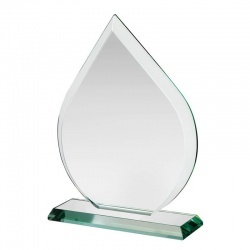 12mm thick jade glass plaque in teardrop design. 3 sizes. Asymmetric jade glass plaque with blue insert and silver panel. 7.25in tall. 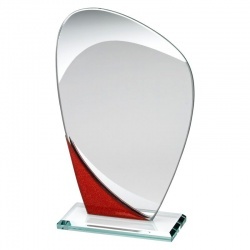 Asymmetric jade glass plaque with red insert and silver panel. 7.25in tall. 10mm jade glass. Gift boxed. Colour print option. 7.5in tall. 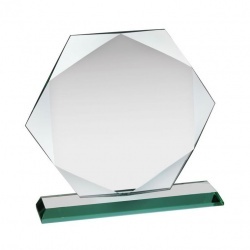 Octagonal plaque in jade glass with silver line decoration. 7.5in tall. 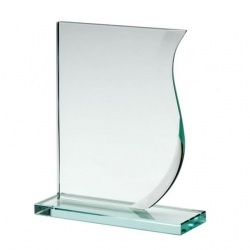 7.5in Wavy Style Plaque in 10mm Jade Glass with Chipped Edge Design. 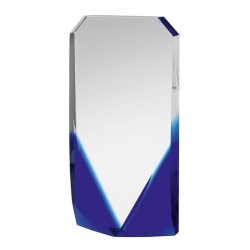 Jade glass plaque with sporty blue and gold decoration, 7.5in tall. 10mm thick jade glass. Gift boxed. Colour print option. 7.75in tall.